Loved the atmosphere, great place. I've got an idea. 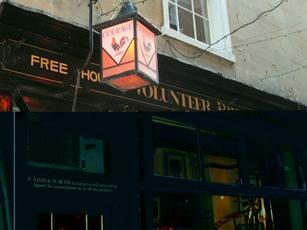 Why not let customers give their opinions of the pub instead of publishing feuding trolls? 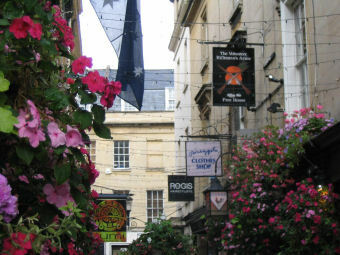 I visited this pub on a hot day in late July, and enjoyed the pint (Bellringer @ 3.60) and the company very much. I first visited in 2011 and had a similarly pleasant time. 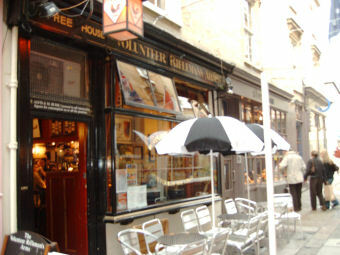 The sort of pub tourists should seek out, as they are a disappearing breed. TheVolunteerRiflemans, assuming the post is genuine and you are telling the truth, this is my response. Firstly let me say that I also run a city centre small friendly pub with similarities to your own, so I do actually know what I am talking about. Regarding making savings by cleaning the lines fortnightly rather than weekly. Firstly, let me say that I cannot imagine only cleaning my ale lines every 14 days. We clean our ale lines every time a barrel is changed, which is on average every 3.5 days. Are you really saving that much money? Yours is a small pub, I seem to remember, so I might assume 3 ales, 2 ciders, 3 lagers and a Guinness. 9 lines at roughly 3 pints per line (assumption) would be 27 pints aka 27 pounds a week. But it's a false economy because even if you cannot tell the difference, there are definitely going to be some people who do. And they might stop coming in so often or at all, and could tell other people that better beer can be found elsewhere. There are things you can use to minimise this waste, while not compromising on quality. Message me if you would like to know some ways to do this. In many pubs I have seen, many pints are wasted into drip trays though lazy or unnattentive bartending. (I have worked a bar that literally threw 70 pints of drip tray ale waste down the drain in a single night, [turnover c£4000 for the evening.]) If every drip tray is filled once a night, that is a total of 9x7 pints a week wasted, an amount that could surely be halved by constant nagging of staff. And equal or greater savings can be made in other areas, such as refuse costs, or energy. JDW's saved a small fortune by instructing their managers to turn on the glasswasher a few hours later than usual. Ten Led bulbs replacing halogen or incandescent can save a few pounds every week on bills. Ok ok you caught us out. We will no longer write our own posts, or engage our staff and regulars to do the same. I'm stopping reviewing my pub because people did not like it and started to give me bad reviews on here instead which is bang out of order. You dinlows have no idea how hard it is to run a pub , it takes a lot of time. And it costs a lot of money. I have made savings here and there, go to a cheaper cash and carry for stuff, clean the beer lines every two weeks rather than week because you lose a lot of beer having to do it everyweek. And the quality is just the same. You lot should get a life, you should and only write good reviews about our pub. Then I wouldn't have to I tell ya. You lot always want something for nothing. Well I'm stoppin it from today. Tu es un fils de pute , dáccord? Gann: "Sadly, for reasons better known to themselves"
Hi Gann. I think the reason might be that this usually features on the BITE homepage favourites, so they're either trying to keep it there, or get it to the top, perhaps.